THE Olive Press is demanding action against a string of fake holiday rental sites falsely advertising luxury villas across Spain. 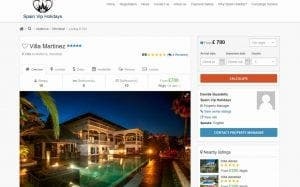 It comes after we reported last issue that scam site Rentholidaysvillas.com was conning British tourists out of thousands of euros each year. In total, British victims lost €8.16 million in holiday scams last year, a year-on-year rise of 20%, claims the Association of British Travel Agents (ABTA). We have now discovered many other websites running similar fraudulent schemes, including balearicvillaescapes.com, Luxurydreamsvillas.com and www.digitaldreamsholidays.com. 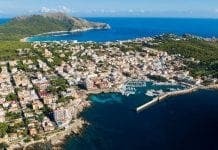 Photos of an eight-bedroomed Mallorca property, advertised from €800 per night on a fourth site spainvipholidays.com, have been lifted from a genuine US website. On the genuine site the actual price is from €2,930 a night. 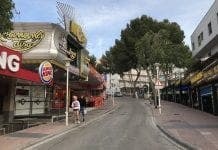 Top-end properties around the whole of Spain are being marketed by the scammers at massively reduced prices to lure victims in. Helle Heredia, from Mallorca-based rental firm Novasol, said she had heard of ‘25 to 30’ recent cases of people being scammed but believed there were ‘many more’. “It’s so scary with these scam sites – they pop up with just one purpose, of robbing people of their money in the most important time of everyone’s year – their holidays,” she said. The fraudsters, who are very difficult to track down, are very good at creating fake profiles and, as revealed last issue, the photo for the agent ‘Flavio’ for rentholidaysvillas.com was actually an Australian estate agent. We have now discovered that a photo of Balearicvillaescapes ‘property agent’ Alba Portillo Olivares is actually a stolen photo of a leading Ibiza luxury villa rental company’s director. Both fake websites Spainvipholidays.com and Balearic Villa Escapes.com are listing the same properties, use the same website template, with both website domains having the same Google verification key. An IT expert told the Olive Press that this was a classic case of ‘domain farming’ and criticised Google for not taking the sites down immediately. All three scam websites are hosted by US-based firm GoDaddy, which also hosts Renholidaysvillas.com. The UK’s Action Fraud confirmed it is now investigating rentholidaysvillas.com, although at the time of going to press had not responded to our enquiries. GoDaddy was made aware of Rentholidaysvillas.com’s fraudulent activity in April, but the site, and the three others, are still live.